Businesses in nearly any industry can take advantage of the many benefits offered by an RFID system. Much like a standard barcode system, an RFID system can help you streamline your business processes, but RFID systems offer added technological advantages not found with typical barcode systems. At Tri-State Business Systems, we can work with you and your company to determine which system is most recommended for your applications and needs, and we can provide you with the iimak, Zebra or other brand products you need. Tracking: Both RFID systems and barcode systems offer tracking capabilities, which allow you to track inventory, shipments and more. Data Collection: Both systems are able to collect and store data, but an RFID tag often supports more data storage and collection than a barcode system does. Speed: Because an RFID scanner can read multiple tags at once and only needs to be near the tag as opposed to in a direct line of sight of the tag like a barcode scanner, it is also far more efficient to use an RFID system when scanning multiple items at once. Function: An RFID system allows you to inventory items without unpacking them, and better still, inventory movements can be tracked via antennas and scanners that are strategically located throughout the warehouse to track their movements in real time. 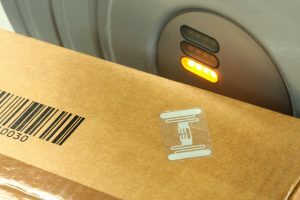 Accuracy: Because barcode scanners are more labor-intensive and require a direct line of sight, there is much more human interaction involved. For this reason, it is often found that an RFID system allows for greater accuracy over time. Cost: Barcode scanning systems are often less expensive than RFID options, making them a preferred system for companies that are more concerned with cost than efficiency. Our team of experts can help you determine the system that is right for you after collecting some basic information about your business and your processes. We can then customize a comprehensive solution to help you meet your company’s growing needs. In addition to barcode and RFID equipment, we also offer a wide range of barcode and RFID supplies, including iimak ribbons, Zebra ribbons and more to keep your business processes operating smoothly. For iimak ribbons, Zebra ribbons and labels, RFID system components, and more, turn to none other than Tri-State Business Systems. We currently serve those in Branchburg, Flemington, Rowland Mills, Hopewell, Mt. Rose, Princeton and beyond. Contact us now for further details, quotes, orders or product questions. We look forward to serving you!